A Kremlin-linked troll is once again demonstrating how difficult it is for Twitter to police its own platform. 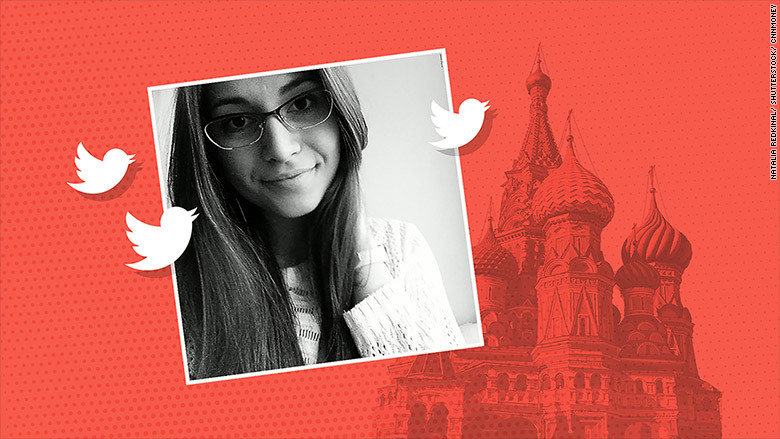 An account using the pseudonym "Jenna Abrams" posed as a conservative American for years and amassed a following of more than 70,000 before Twitter eventually determined it was part of an operation run by the Internet Research Agency, a troll army based in St Petersburg, Russia, with ties to the Kremlin, and shut it down. Thanks to news reports about it, it became one of the most infamous of the Russian troll accounts after it was taken down. Another account using the "Jenna Abrams" identity and the handle @RealJennaAbrams popped up early this month and remained live for more than a week until CNN published an article revealing its existence. Twitter, which had said it was looking into it, shut it down minutes after CNN's article went live. Less than a week after that, another "Jenna Abrams" account appeared -- again under the handle @ReaIJenna Abrams, the only difference being that this time the the lower case "l" in "Real" had been replaced with a capital "i." As of Tuesday afternoon, it had been live and tweeting for five days without Twitter taking any action against it. Twitter suspended the new account shortly after CNN asked the company about it. Asked why it had suspended the account now, a spokesperson said the company does not comment on individual accounts. The new account had been left up until CNN pointed it out to Twitter despite the fact that the person or people running it were not subtle about its links to the previous two iterations. The second version of the Abrams Twitter account was first announced on a Wordpress blog linked to the Abrams identity. This newest account was also announced there, and the account included a link to the blog in its profile and tweeted a link to a post on it as well. The second version of the Abrams account appears to have been registered using the email address jenn_abrams@protonmail.com. The newest account used a different email address to sign up, but the protonmail address was prominently displayed in the account's bio. Before it was shut down Tuesday afternoon, the account had sent 33 tweets -- several alluding to Russian trolling. The newest account attracted very few followers, but the fact that it went live and remained up until CNN asked about it throws into question Twitter's ability to tackle disinformation on its platform, including any potential Russian campaigns targeting the 2018 U.S. elections. Twitter had recently told Congress that it is working to ensure "the experience of 2016 never happens again." "I think for social media companies like Twitter that operate at a really large scale there are two important aspects of solving this problem," Jonathon Morgan, the founder of New Knowledge, a company that tracks the spread of misinformation online, told CNN. "One is, unfortunately for them, more human involvement in policing the platform and enforcing suspensions." "A small number of people relative to the revenue of the company could help solve this," he added. When Senator Mark Warner -- the top Democrat on the Senate Intelligence Committee, which has been investigating how Russia used social media to meddle in last year's U.S. presidential election -- learned from CNN that a third Abrams account had emerged he said that although he had been encouraged by some of the ways the platforms like Twitter had pledged to address this problem, "they cannot be complacent." "This will require sustained resources and continued vigilance to ensure they are not used to sow disinformation to their users," he said.